It is situated within easy reach of the cities of Mantua, Parma, Cremona and Reggio Emilia since Viadana is geographically in the middle of these four provinces. 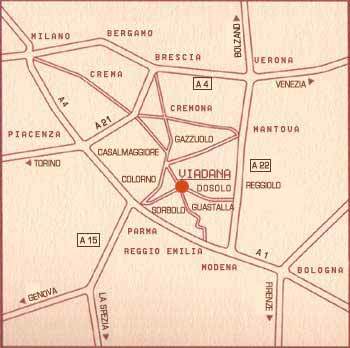 The hotel is 40 Km from Mantua, a beautiful old artistic town, 10 Km from Sabbioneta, the old town of the Gonzaga, 5 Km from Brescello, the town where the famous films of Don Camillo and Peppone were shot and where there is a museum dedicated to these characters, and 25 Km from the trade show district of Parma. Highway "Autostrada del Sole" - A1 - from Milano/Milan: exit Parma Centro, about 30 km from Viadana. After exiting the Highway follow the signs on the left for the towns of Colorno (PR) and Casalmaggiore (CR). At Casalmaggiore continue to the right and follow the signs for Viadana. Highway "Autostrada del Sole" - A1 - from Bologna: exit "Reggio Emilia", about 30 km from Viadana. After exiting the Highway follow the signs on the right for the town of Mantoua/Mantova-Poviglio-Boretto-Viadana. Highway "Torino/Brescia" - A21 - exit "Cremona": about 50 km from Viadana. 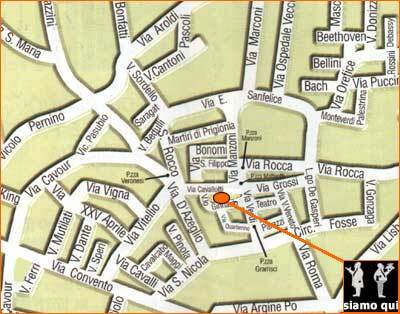 After exiting the Highway follow the signs for S. Giovanni Croce (CR) and Casalmaggiore (CR). At Casalmaggiore follow the signs for Viadana. Highway "Autostrada del Brennero" A22: exit "Mantova Nord", about 45 km from Viadana. After exiting the Highway follow the signs for Parma and Sabbioneta (MN). After reaching the town of Mazzuolo (MN) continue on the left and follow the signs for Viadana. Parma railway Station - about 25 km from Viadana. Mantova/Manoua railway station - about 40 km from Viadana. Aéroports Giuseppe Verdi - Parma (Parme) -about 30 km from Viadana. Aéroport Valerio Catullo - Caselle di Sommacampagna (Verona)- about 80 km from Viadana. Aéroport Gabriele d' Annunzio - Brescia-Montichiari- about 70 km from Viadana. Aéroport de Linale (Milano/Milan) - about 150 km from Viadana. Aéroport Intercontinental Malpensa 2000 - Milan (Milano)- about 190 km from Viadana.